envelople4cindy, originally uploaded by Leah Virsik. It’s day 5 of Leah Piken Kolidas’ Art Every Day Month Challenge and I’m getting so much more out of it than I anticipated. I had a lot of fun painting postcards tonight. I’ll show them when they are dry and then I’ll be mailing them out to lucky recipients! It’s really interesting…making something with the intention of sending it off in the mail… what’s coming up for me is that it doesn’t have to be so perfect. I’m playing and whatever I do is going to be more interesting than a plain white envelope. I made this envelope above from a Paper Source A2 template. I like the templates, although one can make a template from tracing an envelope too. The Good Mail sticker is from Jennie Hinchcliff and Carolee Gilligan Wheeler’s Good Mail Day. Fabulous book and where my inspiration (and permission) came from to create mail art. The pink parts are Japanese tape which I got here. It’s much smaller than the pictures look. I was amazed it was so small but it’s lots of fun to experiment with. I thoroughly enjoy process and listening to creator’s talk about their process. This evening, while creating, I enjoyed listening to Terri Gross interview Director Lee Daniels. They talked about his new film “Precious” and how he changed after making it. I don’t see many films, but this interview made me want to see this film. Art Postcards, what a lovely idea. It sure is nice to have “play time” every day isn’t it. I’m feeling so inspired! So glad you enjoyed the process…I think that’s a major part of making art really. Lovely piece…just love how everything looks so well put together, wow! What a great idea to create the specialized envelopes. There will be some lucky recipients! When I was a little girl I thought being a mail delivery person would be so cool – seeing all that mail from so many places! I was an avid, active pen pal and wrote to other little girls who loved to write and create all across the US. Looking at your art from today brings back those treasured memories – the running to the mailbox, the hungrily shuffling through and taking my letter treasures to a special place where I could read in quiet and immediately begin my response…. this tactile experience is disappearing… your art keeps it alive. Thank you!! Rachel, yes play! Glad you’re inspired. Rachel, Kelly, and wildish woman thanks for your comments. If you’re up for exchanging mail art, let me know! Linda, thanks! Yes, process. I’m learning to just put it up there, out into the world and not worry so much about the results. Julie, thanks so much for sharing! I’m excited to hear about your memories. How fun! I’ve been so touched and moved to action by Carolee Gilligan Wheeler and Jennie Hinchcliff and their “Good Mail Day” that I can’t help but pass it along. I’m very grateful to Leah Piken Kolidas too for creating this space to connect. Thanks for visiting my blog today and for your lovely comments. You inspired me to visit your blog and see your art. 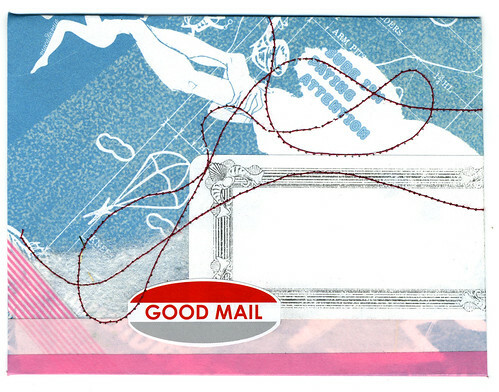 Love the colors, collage, and the idea of mail as art. Snail mail is becoming a thing of the past. I still remember the thrill of drawing all over an envelope, of using wax to seal it with my special wax seals. Email just doesn’t do that for me! Thanks for bringing this fine art back to the fore. I look forward to seeing more of your creations. Julie, thank you. Ahh, I didn’t comment on the blue part, it’s a poster actually from a Veer http://www.veer.com/ mailer. Oh, I’m loving your your mail art. They’d look great framed as a series! Sandy, thanks for your comment. The process of making mailing special (or anything else for that matter) is really enjoyable. My husband, Tom and I saw the film “How to Draw a Bunny” http://en.wikipedia.org/wiki/Ray_Johnson. It’s a really interesting film on Ray Johnson, considered the “Founding Father of Mail Art”. It’s a little bizarre but I thought the film was really worth seeing. Tom brought Ray Johnson again as I started making these mail arts.